North Carolina settlers from Europe or of European descent remained mostly in the Coastal Plain Region until about forty years before the American Revolution (1775– 1783). The fall line, with its waterfalls and rapids, made traveling on rivers difficult and discouraged migration into the Piedmont from the Coastal Plain. But once settlers began arriving in the Piedmont, they came in great numbers and helped make North Carolina's population grow rapidly. The colony's population more than doubled in the decade from 1765 to 1775. The Piedmont stretches from the fall line westward to the edge of the Appalachian Mountains. This colonial backcountry differed from the low-lying Coastal Plain. Its limestone and clay soils supported forests and grasslands. Its swift-flowing, shallow streams and narrow rivers were not good for boat traffic, but they offered excellent sites for mills and farms. Though few roads ventured into the backcountry, two were vital to settlement of the region. The Great Indian Trading Path began in Petersburg, Virginia, and traveled southwest through the Piedmont to present-day Mecklenburg County. It had been used for centuries by Native Americans, and in the mid-1700s settlers began using it to travel into North Carolina. The second major road used by settlers was the Great Wagon Road, which stretched from Pennsylvania through Virginia's Shenandoah Valley and into North Carolina. Initially the push for European settlement of the Piedmont came from English colonists living in the east. But Piedmont rivers such as the Broad, Catawba, and Yadkin/ Pee Dee flowed south into South Carolina. That made communication and trade with the eastern part of the colony difficult and discouraged settlers from the Coastal Plain. For this reason, only a few came inland from coastal towns, and by the 1730s Piedmont North Carolina was just starting to grow. Early Piedmont settlers were primarily Scotch- Irish and German people who were descendants of Pennsylvania, Maryland, and Virginia settlers. These settlers came down the Great Wagon Road. Many left their home colonies because suitable land in those colonies had become scarce and expensive. The Scotch-Irish, or Ulster Scots, were descendants of Scots who had moved to Northern Ireland. They had prospered in Ireland until changes in English policies led many to migrate to America, where most settled in Pennsylvania. They began to arrive in North Carolina in the 1730s, leaving Pennsylvania after crops were harvested in the fall and arriving in the Piedmont in time to plant winter crops and seedlings that they brought with them. On small farms these Scotch-Irish settlers grew corn for home use and wheat and tobacco for use and for export. They raised livestock and drove them in large numbers to northern markets. Settlers built stores, gristmills, sawmills, and tanneries. Blacksmiths, carpenters, coopers, potters, rope makers, wagon makers, and wheelwrights established many local industries. Brewers, distillers, weavers, hatters, tailors, and others practiced their trades either in isolated homes or in shops in towns. Germans of Lutheran or German Reformed faiths came to Pennsylvania and then to the Piedmont for many of the same reasons as the Scotch-Irish. Most of the Lutherans settled in the area drained by the Catawba and Yadkin Rivers. Some joined members of German Reformed congregations in settling all across the backcountry. Moravians, also from Germany and then Pennsylvania, arrived in present-day Forsyth County in 1753. They began building a well-planned, tightly controlled congregational community. Land was held in common, and crafts, occupations, and even marriages required approval from community boards. Salem and its outlying settlements prospered and provided neighbors with mills, tanyards, shops, crafts, medical care, fine music, and other economic and cultural amenities. 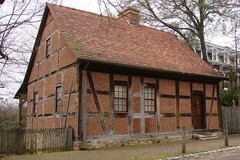 Many of the German settlers clustered together and preserved their native language in homes, churches, and schools. German publishers prospered in Salisbury and in Salem. Gradually many of the settlers adopted English-sounding names and switched to speaking the English language. With very different cultures and religious beliefs, the Scotch-Irish and German groups established neighboring settlements and towns but had little contact with each other. They came in such numbers that six new counties were created in the Piedmont between 1746 and 1763. Settlers of English descent also came into the Piedmont. Two groups concentrated in the northern part. By 1754 English Quakers had organized the New Garden Monthly Meeting. This congregation attracted settlers from several counties in the Piedmont. The other English group included settlers from central Virginia, mostly Baptist, who arrived during and after the French and Indian War (1754–1763). Americans of African descent came to the Piedmont in small numbers during the colonial period, usually accompanying their masters from other areas. Many groups who had not previously owned slaves acquired slaves as their wealth increased and as neighboring slaveholders made the practice appear more acceptable. Rarely did colonial slaveholders in the Piedmont own more than a dozen slaves. In 1775, only fifteen thousand of the fewer than seventy thousand slaves in North Carolina lived west of the Coastal Plain. Most of the settlers in the Piedmont were small farmers and did not own slaves. The ebb and flow of settlement in the Piedmont was influenced by two key events. The French and Indian War interrupted settlement when threats of Indian attacks frightened backcountry settlers into leaving their farms and fortifying their towns. Then, in 1766, local conflicts erupted when backcountry settlers in the Piedmont, calling themselves Regulators, tried to fight government corruption, unclear land laws, and problems in the court system. They also opposed paying taxes to help build a governor's palace in the Coastal Plain at New Bern. Eventually colonial Royal Governor William Tryon raised an army that fought the Regulators at the Battle of Alamance Creek in 1771. The Regulators were defeated, but their movement was an example of worsening tensions between the older eastern settlements and the rapidly growing backcountry to the west. As the population of the Piedmont grew, so did its towns. While the majority of backcountry immigrants settled on farms, others settled in and established towns. Many towns were established along the two main roads in the region. The Moravian villages of Bethabara (1753), Bethania (1756), and Salem (1766) were not far from the Great Wagon Road. Hillsborough (1754) and Charlotte (1766) were established on the Great Indian Trading Path. Salisbury was established in 1753 where the two roads crossed. Most of these towns had stores, taverns, craft shops, churches, and schools. Salisbury, Hillsborough, and Charlotte were places for county courts to meet. On court days, people came into towns to trade, buy supplies, and socialize with friends. Also in towns, as well as at large farms and crossroads stores, farm and craft products were gathered together for shipping to the coast. Once there, they were traded for goods and supplies that backcountry settlers could not produce for them-selves. In a similar manner, flocks or herds of livestock were gathered to be driven to distant markets. Because of the geography of the Piedmont, much of this trade flowed outside the colony. Few roads connected the Piedmont with the Coastal Plain. Around Hillsborough, for example, many settlers sent goods up the Great Indian Trading Path into Virginia instead of to North Carolina ports such as Edenton. People living in the northwest Piedmont still found it easier to send goods north along the Great Wagon Road. Other goods from the Piedmont traveled on rivers that flowed into South Carolina. Colonial and county officials were concerned about the destinations of goods from the Piedmont. They built or improved roads to courthouse towns, mills, and stores to make trade with the east easier. Their efforts proved successful, and by 1760 Piedmont settlers were sending goods overland toward the coast. A 1773 pamphlet reported that "40 or 50" wagons filled with "beef, pork, and flower [flour] in barrels, also their live stock, Indian corn, raw hydes, butter, tallow, and whatever they have for market" were arriving daily in the small town of Cross Creek (present-day Fayetteville). These and other products, including wheat, deerskins, tobacco, naval stores, and flaxseed, were then loaded onto rafts and floated down the Cape Fear River to Wilmington. By the 1770s, settlers in the North Carolina Piedmont occupied the best land. 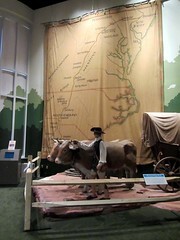 Seeking new land, other settlers began migrating to the Mountain Region of North Carolina and beyond. Wilson, David. September 25, 2011 in Charlotte, NC. "Great Wagon Road map." Located at http://www.flickr.com/photos/davidwilson1949/6242040605/. Accessed February 24, 2012. Learn NC. October 11, 2007. 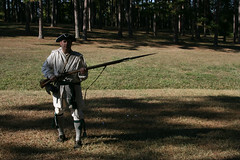 "Regulator Re-enactor with Musket and Bayonet."http://www.flickr.com/photos/31008243@N06/3174181475/. Accessed February 24, 2012. January 23, 2007. Downtown Winston-Salem, North Carolina. Old Salem in North Carolina. http://www.flickr.com/photos/larrywfu/345650198/. Accessed February 24, 2012. I think this site is awesome for children. I really recommend this site!